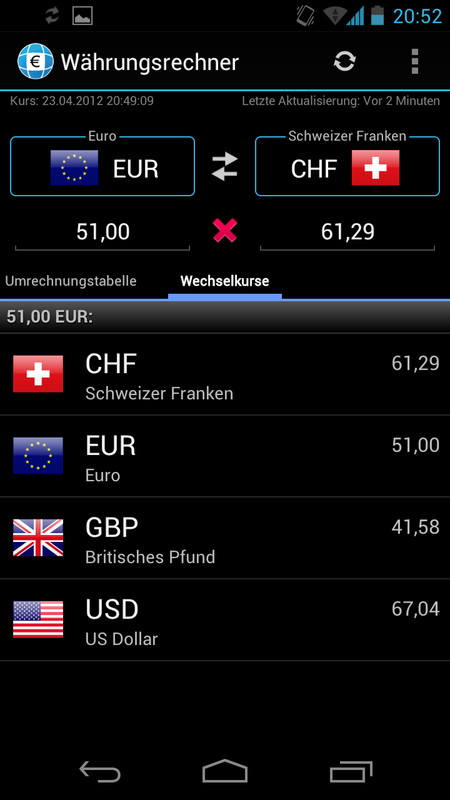 Finanzen100 Currency Converter – How much is it? Some people enjoy calculating and converting currencies—for others, doing so is on par with watching paint dry. If the latter applies to you, a currency converter app is just the ticket. We decided to check out Finanzen100 Currency Converter after hearing a lot of positive reviews. Find out all about the app in our review. 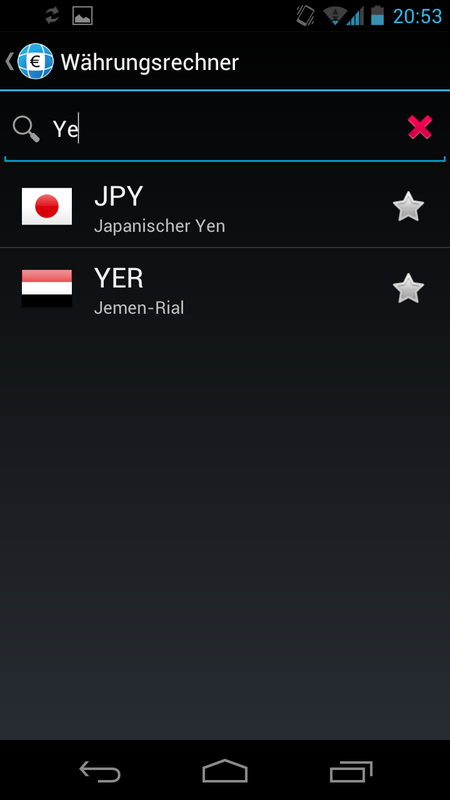 The app lists all relevant features a currency converter should provide in the main page: a vast list of currencies, the amount and the corresponding exchange rate. Uodated information on rates and prices is listed at the top of the display. Because of the sheer number of available currencies, marking the currencies you need to use most often as your favourites is a good option. This will mean that they'll always appear at the top of the list. There's no fast scroll option to help you run through the list quickly, which is too bad. In order to convert an amount, add details regarding the currency of origin and you're good to go. You can navigate these tabs by swiping. The conversion table is set as the standard, but this can be changed in the settings. Round sums (e.g. 1, 2, 5, 10, 20, 50, 100) are displayed in the table and can be calculated from the source currency or the currency you want. A nice little option that helps you get information fast. The tips option allows you to calculate percentages and how much a certain percentage would be in a given currency. 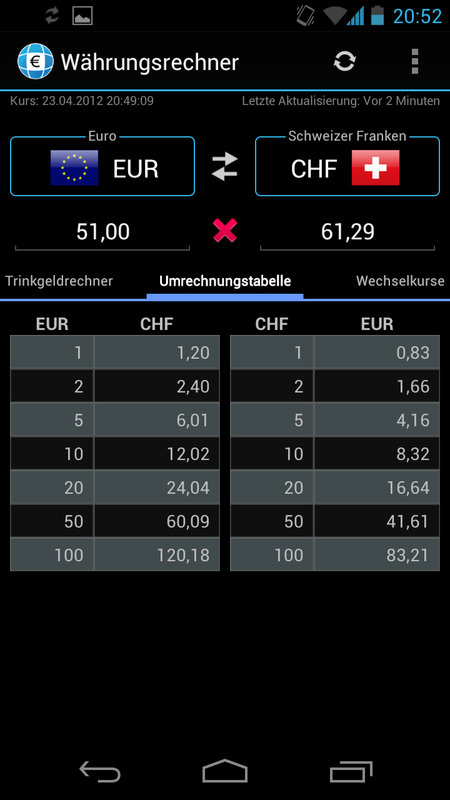 Finanzen100 Currency Converter is a very useful and easy to use tool for people who deal with different currencies. The app is easy to use and the whole thing seems to be geared towards user friendliness and comfortable navigation. The only thing that's missing for my liking is the fast scroll button within the currencies list. 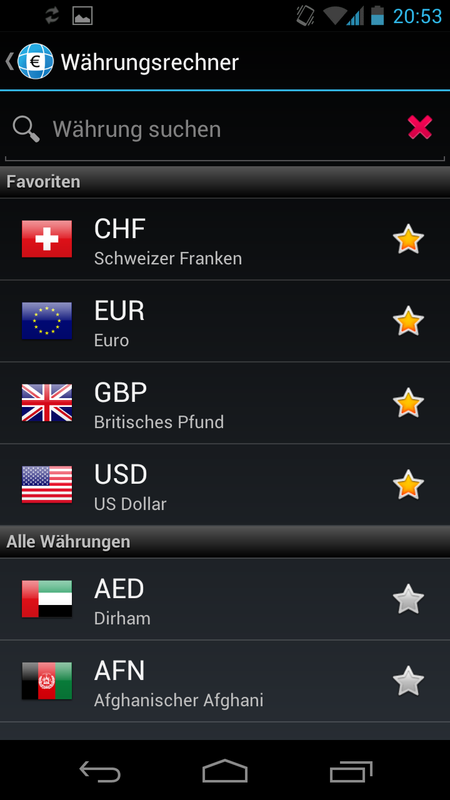 As mentioned, we love the Finanzen100 Currency Converter layout and design on Android 4. Clear, straight-forward and very true to the classic Android look + easy controls is a well deserved five stars in our book. Very good overall performance: Finanzen100 Currency Converter doesn't crash and loads very quickly. 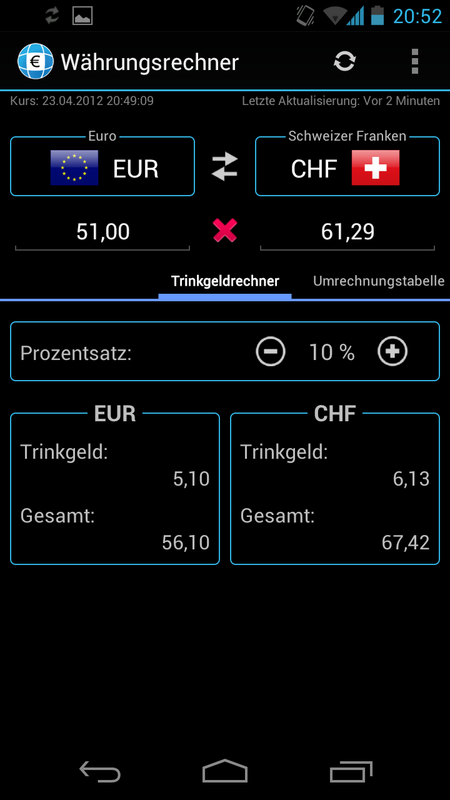 Finanzen100 Currency Converter is free and doesn't feature any ads. It's a great tool and deserves a full five star rating in this category. It can be downloaded from the App Center or Google Play.